3B Umpire Fieldin Culbreth ejected Mets Manager Terry Collins (unintentional interference foul ball call by Roberto Ortiz) in the top of the 4th inning of of the Brewers-Mets game. With one out and the bases loaded, Brewers batter Eric Sogard hit a 0-1 curveball from Mets pitcher Zack Wheeler on a fly ball into foul territory near the third base dugout. Replays indicate that as Mets third baseman Wilmer Flores attempted to catch the batted ball, he collided with a batboy, who was attempting to get out of the way. 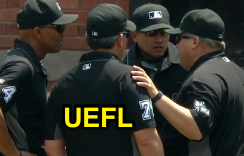 Initially ruled an out by HP Umpire Roberto Ortiz, the call was reversed to that of unintentional interference after consultation amongst the umpires and a determination that the batboy did not intend to interfere with the play, the call was correct. * Play was reviewed and affirmed by the UEFL Appeals Board (8-0-1), the call was correct. At the time of the ejection, the Brewers were leading, 2-0. The Brewers ultimately won the contest, 2-1. This is Fieldin Culbreth (25)'s first ejection of the 2017 MLB regular season. Crew Chief Fieldin Culbreth now has -4 points in Crew Division (-5 Previous + 1 Correct Call = -4). *Rule 6.01(d), titled Unintentional Interference states, "In case of unintentional interference with play by any person herein authorized to be on the playing field (except members of the team at bat who are participating in the game, or a base coach, any of whom interfere with a fielder attempting to field a batted or thrown ball; or an umpire) the ball is alive and in play. If the interference is intentional, the ball shall be dead at the moment of the interference and the umpire shall impose such penalties as in his opinion will nullify the act of interference." *Rule 6.01(d) Comment states, "The question of intentional or unintentional interference shall be decided on the basis of the person’s action. For example: a bat boy, ball attendant, policeman, etc., who tries to avoid being touched by a thrown or batted ball but still is touched by the ball would be involved in unintentional interference. If, however, he kicks the ball or picks it up or pushes it, that is considered intentional interference, regardless of what his thought may have been." ^Roberto Ortiz is Calling and Fieldin Culbreth is the Secondary umpire pursuant to UEFL Rule 6-2-c. This is the 57th ejection report of 2017. This is the 31st Manager ejection of 2017. This is NY-NL's 2nd ejection of 2017, T-2nd in the NL East (MIA 5; NYM, WAS 2; ATL, PHI 1). This is Terry Collins' first ejection since July 30, 2016 (Jeff Kellogg; QOC = Y [Replay Review]). This is Fieldin Culbreth's first ejection since August 3, 2016 (Terry Francona; QOC = N-C [Replay]). Wrap: Milwaukee Brewers vs. New York Mets, 6/1/17 | Video via "Read More"